You heard me right- veggie muffins. 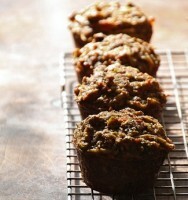 Get your daily dose of vegetable rich vitamins and minerals in the convenience of a muffin. They are great dance bag travelers! Make a well, add eggs, veggies and parsley. Mix lightly, gradually add milk. This is supposed to be lumpy so don’t work too hard! Spoon into muffin tray that is lightly oiled. Remove and allow to set for 10 minutes, then serve. Ooh, I LOVE this idea! What veggies do you like best in this recipe? Hi Carly! Some of my favorites are cooked pumpkin, zucchini, squash, and spinach (mmmm!). If I have any dried fruit around like cranberries or raisins, I toss them in too. What do you think you’ll use? I love hearing what everyone comes up with! Hi, Joanie! I LOVE the idea of pumpkin… yum! Would sweet potato would work well too, then? Spinach would be a great way to get more greens in; have you used kale in this recipe? I have two little ones (and a husband who just won’t eat his vegetables! ), so the more I can get veggies into their diet, the better. I’ll definitely try this out and let you know how it goes. Thanks, Joanie! Sweet potatoes, yes! Kale, yes, yes! 🙂 I haven’t used either in this recipe but it’s making me excited to try! Little one’s (and husbands too!) love a touch of sweetness so try the dried fruit in theirs. Let me know what combination you test and how it turns out. I can’t wait to hear how it goes. Maybe I’ll whip up some kale muffins for myself. Dried fruit sounds delicious. I’ve never used spelt before. Could a white flour/wheat flour mixture be substituted in its place? Can’t wait to checkout your other recipes! Because of spells solubility, recipes that use spelt tend to use a little less liquid. If you are going to substitute with whole wheat flour instead, you may need to use a little more milk. I haven’t tried this specific recipe with flour though. You could always take your favorite muffin recipe and “sneak” some veggies into the ingredients. Baking is a science so it may take a little experimentation. I tend to be a disaster when it comes to following baking rules! I like a little of this and a little of that and take good notes for next time! Looks like I’ll have to find some recipes using spelt :). Thanks, Joanie! What an awesome recipe! So healthy and full of vital vitamins and nutrients for those that are active. I will be sharing this with my clients on our wegpage! Glad you like it! Share the love! As a ballet teacher I am always looking for good eating tips for my students. great stuff.